2. Choose an SSH client: There are numerous SSH clients, many of them downloadable for free. On CAE Windows lab machines, the installed SSH client is PuTTY (one of the free clients) so we'll use this program in the example below. You can launch it by searching &no_frill=1"putty" in the Start menu and selecting it. 3. Connection Settings: Enter best-tux.cae.wisc.edu into the Host Name field (step 1 in the graphic below), make sure the connection type is SSH, and select Open at the bottom of the PuTTY window (step 2 in the graphic below). 5. Enter Login Credentials: PuTTY will then load the command line, first asking for your CAE user name, and then your password. Very occasionally, PuTTY will error out at this stage or immediately after, in which case just go through the setup again, and it should work. 6. Perform desired command line operations: After credentials have been verified, you'll see the welcome screen, and be able to perform command line options on the CAE Linux lab machine that your connection was routed to. As the name implies, connecting to best-tux.cae.wisc.edu will connect you to the CAE Linux lab machine, with the least load, "best" for working on. 7. 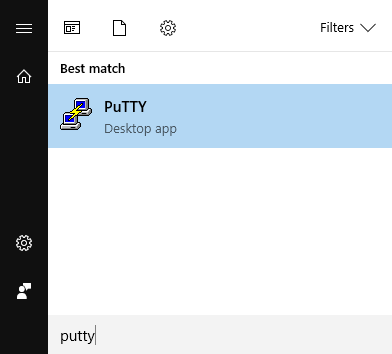 Disconnect properly: when you're ready to end your session, type and enter either logout or exit and PuTTY will disconnect your session as well as close the window. Simply closing the PuTTY window will leave your connection open; not optimal, less safe.